Here’s all that you wanted from an all-round desert cooler. The very special VGD50W provides one of the best in-class air deliveries and offers enhanced protection for the motor and the pump. It looks stylish with its aerodynamically balanced body that offers stability and sturdiness to the product. It is facilitated with unidrip flow water distribution that ensures proper wetting of cooling pads by uniform water distribution. Loaded with an Ice chamber for enhanced cooling that offers an accelerated cooling effect, the VGD50W is designed with wide voltage working range (160V ~ 270V) that runs on extreme input voltage conditions in urban & rural areas. 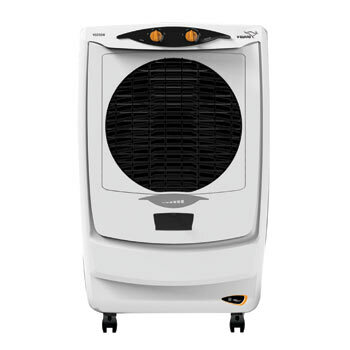 Equipped with Tetra Air Flow Cooling for equilateral cool air flow to all directions and for more area of coverage, this product also boasts of corrosion resistant fan blades that help to avoid rusting of fan blades. VGD50W also works well on inverters. Free wheeling castors with brake wheel provision for front two wheels.